“There are actually wispy clouds up near the ceiling,” Mark Jenkins wrote when he was part of the first expedition to make it completely through the cave in 2011. Airplanes, 40-story buildings and clouds all help give us some sense of the size, but as I listen to the sounds of the cave while writing this post, I really understand what Edström means when he talks about the importance of sound to the type of interactive reportage he is spearheading in the field of journalism. Technology plays a big part in putting us in the middle of the story. 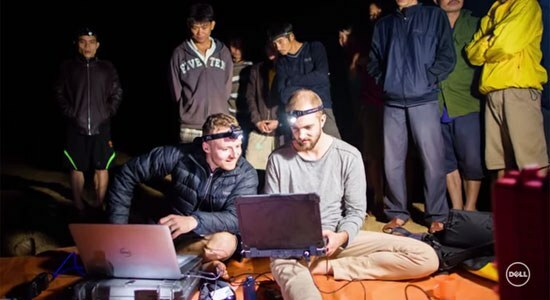 On the Son Doong expedition, Edström needed systems that could serve as mobile powerhouses like our Precision M3800, as well as tough travelers like the Latitude 12 Rugged Extreme. At the end of each day’s shooting, the team needed to sit down and render their work to see if they had captured what they needed. And be sure to block off some time on your calendar to go virtually explore the cave yourself. I thought I’d made it all the way through, but just discovered I’m only about half way. So, I’ll end this post and get back into Son Doong where one of the dolines (my new word for the day) is almost as wide as the roof of my home state’s Superdome!